One sunny day, my husband and I, spring fever victims, rode our tandem bicycle past wetlands. A hallelujah chorus of spring peepers nearly deafened us. Soggy Froggy City posted record decibel levels. 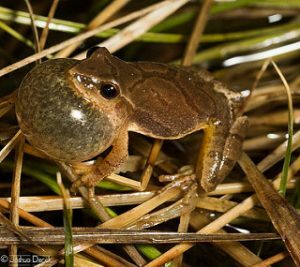 Had these amphibians gone high-tech, renting rock-concert sound systems? After compiling the results of a survey I sent them, however, I’m convinced frogs are musical purists who not only sing without artificial amplification, they don’t even open their mouths. Instead, they balloon their necks. Unlike most human choirs, the majority are males. These guys don’t waste words or melodies. They not only establish territories and predict weather changes with their songs, they also romance their ladies. Listening to their impassioned harmony, I wished I could understand the lyrics. Then, remembering current Top 40 titles, I gave thanks I didn’t. I’m not so enthralled with peeper music that I’d pay $75 to buy a frog online. However, in 2002, the BBC did not consider frogs a joking matter. Intense headlines implied that killer bullfrogs had attacked Great Britain. Having eaten Parliament, they were last seen headed for Buckingham Palace. Further reading, however, revealed that the bullfrogs, an American threat mistakenly imported in batches of water plants, were devouring fish and other small critters. Not a national disaster. But something else for which Europe can blame us. If frogs from South/Central America invaded their territory, they might have reason to gripe. 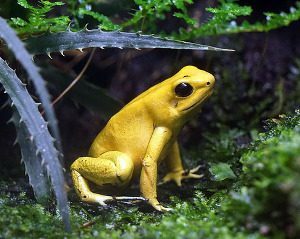 Poisonous frogs abound there, and those who flaunt the loudest wardrobes — gold, blue, orange, and black-and-yellow-striped — present the greatest threat. The poison dart frog of South America, Phyllobates terribilis, is arguably the most dangerous animal in the world. This little golden frog resembles a kindergartener’s eraser. But according to the University of Georgia EcoView, its slime is 400 times as toxic to a laboratory mouse as a king cobra’s venom. 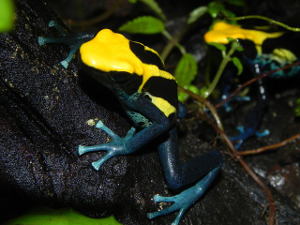 For those who adore poison dart frog songs but prefer long life spans, CDs of their calls can be purchased online. Me? I’ll stick to live, free concerts by less flashy, Midwestern types who stay in their swamps, go to bed on time and only give us an occasional wart. Describe your favorite frog encounter. Or, like biblical Pharaoh, do you consider them a plague? 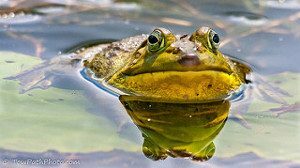 This entry was posted in Coffee Corner and tagged Amphibians, Animals, Humor, Rachael O. Phillips, Seasonal Change, Spring on May 10, 2017 by rachael. Thanks again for sharing your hilarious comment. May the Lord remind you of more fun moments like these. One of my funny frog episodes came when one rode on our front bumper. He rode from Cass-hop-olis to an exit near Frankenmuth, where we stopped for gas, found him, and deposited him in a ditch. I wrote a little story about his ride in a tiny little book. The second one was when a friend of mine showed me her frog collection. Quite normal examples of great froggish art and statuary decorated her shelves. Then she showed me her very favorite frog of all in an envelope. A flattened frog/toad a friend had sent her from the parking lot of Mount Rushmore. Hysterical and historical. Thought I’d never stop laughing. Frampton the Frog! I remember that story, Dori! Such a hoot 🙂 If you still have it, I’d love to read it to my grandkids. Your friend keeps flattened frogs–maybe from the White House, too?! Or the Vatican??!! Thank your this historical, hysterical moment!